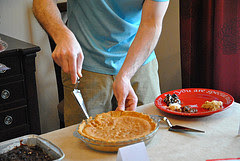 My son-in-law loves pie, especially creamy ones...as he said, "the creamier, the better!" Therefore, my daughter threw him a brilliant pie party; and not one person brought a fruit pie...they were all creamy pies! 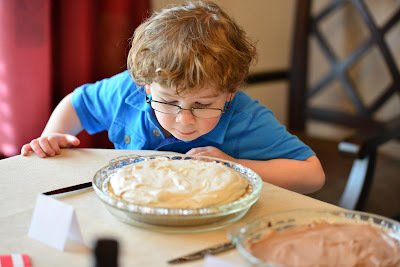 I've been dying to give shot desserts a "shot", so the pie party was the perfect opportunity! 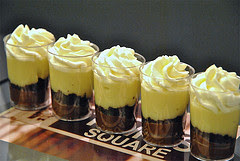 With the birthday boy in mind, I developed these vanilla and chocolate custard pie shots. The effort is broken up, since the recipe is made in portions over a couple of days. The custards require a little attention; but the homemade taste is well worth the effort, and I enjoyed the project! The pie shots were a big hit; and it was a fun, wholesome party, kids and all! They're Pie In Shot Glasses! Bring the half and half to a simmer over medium-low to medium heat in a 2 1/2 qt. saucepan*, hand whisking occasionally to prevent scorching. Remove from the heat. Transfer the custard to a 1 1/2 qt. (ideally glass) bowl and whisk in the vanilla. Cool, stirring occasionally. Gently press plastic wrap directly onto the surface of the custard. Cover the entire bowl with additional plastic wrap and refrigerate the custard overnight, so it will be cold and firm. In case you're wondering about the lovely pie in the fluted white pie dish behind the pie shots, it's a bananas foster white chocolate-peanut butter mousse pie that my daughter made; and it was extremely popular with the group! The Vanilla Custard (Recipe may be halved.) Adapted from a recipe for Vanilla Cream Pie as found in the retro Better Homes & Gardens Encyclopedia of Cooking, Vol. 14. In a 2 1/2 qt. saucepan*, sift together the sugar, cornstarch and salt. Gradually whisk in the milk and mix well. Cook and whisk 2 more minutes, then remove from the heat. Whisk about 1/4 c. of the hot mixture into the slightly beaten egg yolks. Cook and whisk an additional 2 minutes, then remove from the heat. Whisk in the butter, then the vanilla. Transfer to a 1 1/2 qt. (ideally glass) bowl and cool, stirring occasionally. Gently press plastic wrap directly onto the surface of the custard. Cover the entire bowl with additional plastic wrap and refrigerate the custard overnight, so it will be cold and firm. Just deposit one Nabisco Oreo pie crust* into a gal. size food storage bag and crush (not too fine) with a rolling pin, pestle or the side of a mallet. In a chilled mixing bowl, whip 2 c. (1 pint) whipping cream and 3 TB powdered sugar until stiff peaks form and the mixture holds its shape. Refrigerate until ready to use. To neatly fill the shot glasses: For each custard, either use a large pastry bag and large round tip, or cut a very small snip off one corner of a qt. size food storage bag. Sprinkle about a scant 1/2 tsp. of the crushed pie shell over the chocolate custard. Fill with the vanilla custard to about 5/8" from the top of the shot glass. Using a pastry bag with a large star tip, fill the remainder of the shot glass with a swirl of whipped cream. Refrigerate until ready to serve. 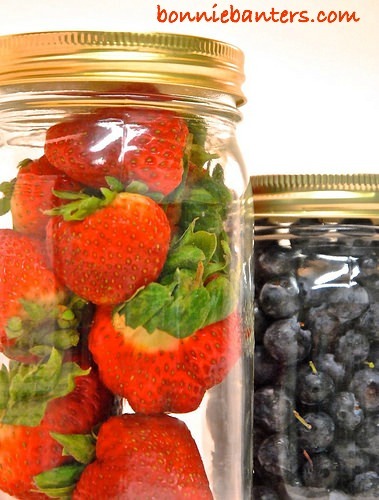 Keeps well in the refrigerator for about one week. I used 1.65 fl. oz. (50ml) plastic shot glasses by Premier Style, available in 20/ea. pkgs., which I found at Publix grocery. To give you an idea of what I bought, here's one source; however, Publix's price was very competitive. I prefer a glass-ceramic (Corningware) saucepan to make these custards, especially the vanilla, in order to avoid grey streaks that could form in the custards when whisking in a metal pan. Use the leftover egg whites for an angel food cake or freeze for later. You will have some crushed pie crust left over...just use it on your ice cream, yogurt, etc. You can crush chocolate wafers and use as an option, if you prefer...I simply found that the pie crust was more reasonably priced and just as tasty. You may have a little chocolate or vanilla custard left over (chef's reward! ), depending on how you fill the glasses. The Birthday Boy Is In Pie Heaven! One Friend's (Male, Of Course!) Contribution...Beer Pie! The pie shots make a real conversation item. 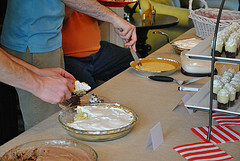 There was a lot of debate at the party: "Are they really pie?" I insisted: "Of course they are...they're pie in shot glasses...they're shots of pie...they're pie shots! (The crust is in the middle.)" 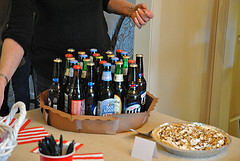 Your pie shots look 'creamylicious' and are adorable, but I can't help cracking up at the 'beer' pie! 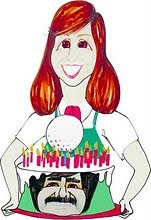 Happy B-Day to your Son in Law - a pie party is a brilliant idea - kudos to your daughter! Hi Regina...Tell Kenny I said not to get too "shot" with all that beer and pie shots! Hi Emma...I'm so glad you like the idea of the pie party. 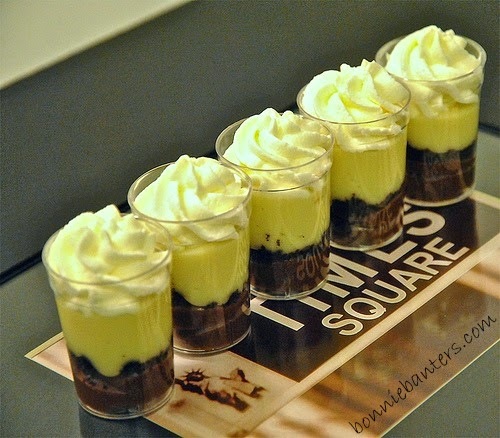 Do try the pie shots...with planning, they're fun to make! 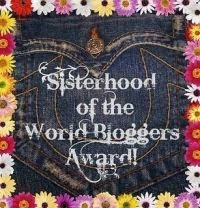 Thanks for stopping by and please visit often! 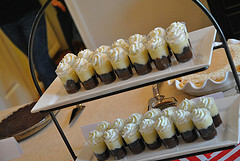 Wow your creamy pie shots look good!! Thank you Patty...The party was a great idea and lots of fun, plus the shots were fun to make! Hope you have a wonderful weekend also! What a marvelous party idea! Happy birthday to your son :) I love the idea of pie shots even more than pie...I must try them!!! Hi Liz...I know you could create some really special pie shots! It was a lot of fun!